As you know, what Mexicans miss the most from their country (besides family and friends, of course) is the food, and while in the US it's pretty simple to find almost all the ingredients, in Europe it is a bit more of a challenge (sometimes even Mission Impossible), but then we find an online store that will drain our bank accounts with outrageous shipping costs, still we do it because we need our spices, sauces, beans, etc. So, I decided to create a fusion burger that could pair both Mexican and Italian ingredients and to do so I used a couple of Mexican super-products and gifts to the world, the tender cactus leaves or nopales and the avocado. I have already written about avocado and all its wonderful properties and uses in this post, but if you didn't know, nopales are the next best thing, high in vitamins and iron and, in raw form, provide a great deal of soluble dietary fiber. They are used in many diets - also on vitamin-booster juices - and they're actually quite good (this comes from someone who used to hate them without even having tried them). So, since you can't find "fresh" ones this side of the pond, we rely on La Costeña's pre-cooked ones. I was in Maine last year (still have to write about it, I know) and paid a visit to Stonewall Kitchen HQ in York, ME where I got my new favorite mustard, the Blue Cheese Herb Mustard and so I decided to add a taste of Maine to my fusion burger. The Italian part comes from the beef patty, of course (if you can try to use Fassone beef, you should be able to find it at Eataly) and from the Primo Sale cheese, which is the Italian equivalent of the Mexican Panela cheese. It is a sheep milk cheese primarily produced in Sicily and Sardinia, very light tasting. A peppercorns and chipotle seasoning spice mix, serrano chili peppers and the bun complete the recipe. First you should wash and drain the nopales, dice them and cook them in a pan (if you want you can add half an onion, chopped) for a couple of minutes. Preheat a griddle for 5 minutes on high heat. Turn the heat down to medium. Place the burgers on the griddle and use a spatula to lightly press down on them. Cook them to your liking for some minutes on each side and sprinkle some spice mix. In the meantime, cut the cheese in 4 slices. Peel the avocado and mash it with a fork, add a pinch of salt (and two drops of lemon juice if you wish). 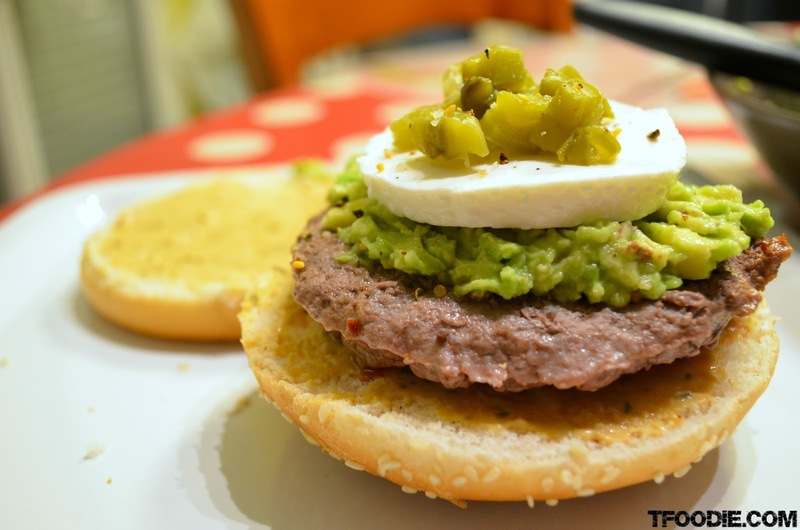 Cut the bread in half and spread the mustard, then place a patty, spread some mashed avocado over it, then a slice of primo sale, a spoonful of nopales, a couple of slices of serrano and sprinkle with the spice mix. Pair it with a chilled Corona beer (a Pacifico would have been better but sadly we don't have those in Italy).